Super Small to Super Tall! Your Home or Hall Is Perfect For Our New Year's Eve Confetti and Streamer Products! 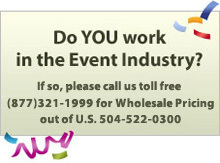 Check Out Our FETTI® Planner to See What Fits Your Venue. Make this New Years Eve the Best Yet! From super small to super tall, we have the New Year's Eve confetti, streamers, and party favors to top off an unforgettable night in style! Whether you are planning an intimate gathering or a nonstop event filled with excitement, we have the party supply products you need. When you want to plan the ultimate New Year's Eve, you want the party decorations and favors from The Flutter FETTI® Fun Factory! What makes our New Years Eve party and parade confetti and streamers so wonderful? Our tissue products are fire-retardant and biodegradable and our metallic film is flame-retardant. Best of all, they are easy to clean up for a no-fuss after-party experience. Find absolutely everything you need at our party supply location. 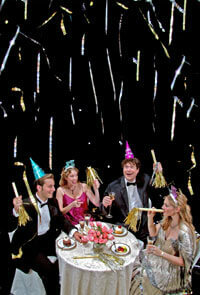 Give your New Year's Eve party confetti and streamer decorations for added fun. Bring the New Year in like never before with chic style and colorful excitement!